Discover Valletta builds on the need of a new learning culture using technology to help students discover historical information in an entertaining manner. It also provides teachers with new tools and resources to help them share their expertise and knowledge. The Valletta 2018 Foundation has launched Discover Valletta – a series of brief narratives about people and places related to our capital city, available in audio format through MP3 players. These will be distributed to all Form one students in state, church and independent schools. Addressing the press following a visit with children from St Ġorġ Preca College, Valletta Primary School and St Albert the Great College, to Fort St Elmo and St Mary Magdalene Church, Valletta 2018 Foundation Chairman Jason Micallef said: “Discover Valletta takes pupils on a journey through the fascinating history of Valletta”. “This project, which is being received very well by students and teachers, was spurred by the fact that even children living in Valletta knew little about sites of importance in the city despite them being very proud of it,” Jason Micallef noted. “Thousands of kits will be distributed to Form one pupils as an aid for their cultural visits in Valletta at state, independent and Church schools, every year up to 2018. Commending the project, Education Minister Evarist Bartolo said: “Investment in education, is equally if not more important, as investment in restoration and regeneration”. He encouraged the students to appreciate the beauty of Valletta noting that it was one of few European cities planned and built as a city and became a model for Washington in the United States. 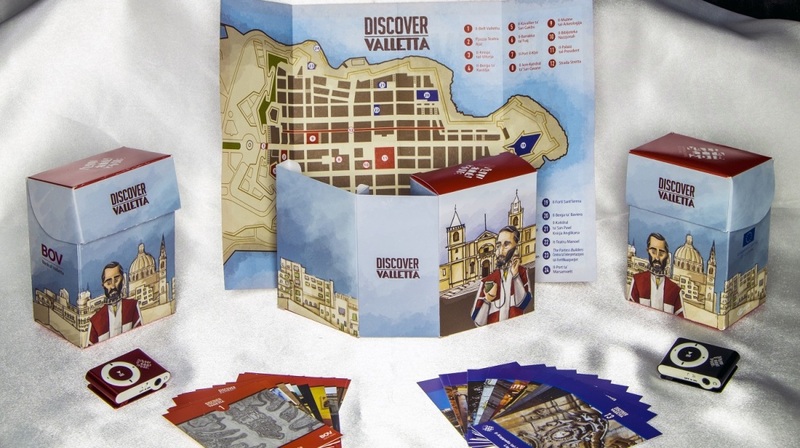 Each pack of Discover Valletta consists of an MP3 player, loaded with 24 bi-lingual audio tracks, outlining the history of 24 locations, together with flashcards with fun and educational information about each and every place. A map of Valletta linking locations and tracks is also included in the Discover Valletta pack. Written by the Trevor Zahra, the stories encourage students to discover new elements of Valletta and reconsider myths and legends from a new perspective. The students will be able to keep the pack, allowing them to revisit the capital city and encourage their relatives to live this fascinating experience.